You are here: Home / Blessay / HP ExpertONE certifications announced. 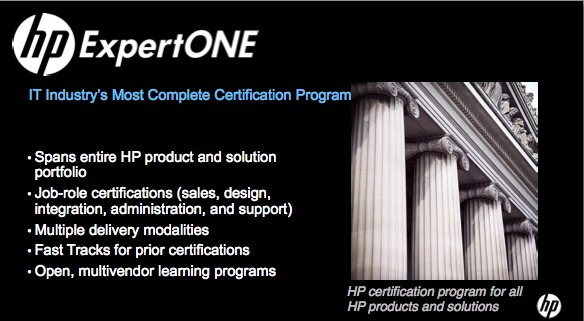 HP made an announcement today on their new certification program. 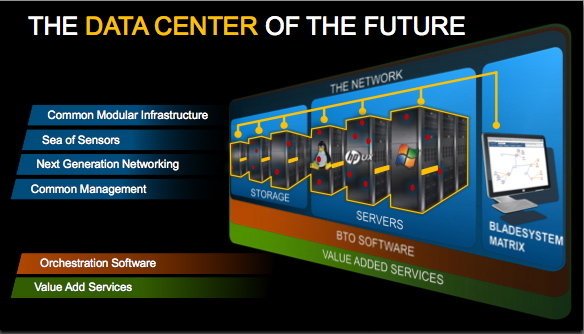 The program is now named “ExpertONE” and is intended to address the idea of Converged Networking. Given that I wrote about the the same topic just a few weeks ago, it’s kind of surprising to see a corporation recognise the same thing ( obviously it’s been in the works for a while ). So HP is focussing the certifications around the idea of the end-to-end services. Given that HP has a full portfolio of products relating to the data centre including the servers, networking and even the physical elements such as PODs and special racks for cooling etc. The certifications are going to start with Networking, then later Servers and the remainder of the product set. Resellers have their own sales focussed certifications as resellers skill up to the new product set. Program looks a lot like the Cisco certification but that’s because its focussed on job roles, and that’s just standard practice for the training industry these days. It’s the fashion for training development this year so even Juniper’s certification look s kind of similar (Ethan spoke with Juniper about their certification program in a recent podcast Runt Packet No. 7 – Big Things Ahead for Juniper Certifications . HP has a new top level certification “HP Converged Infrastructure Architect” which combines server, networking and business skills. Heh, business skills, like engineers don’t have those already. HP will recognise existing certifications as credit towards new certifications, thus a valid CCNP means you don’t have to sit the AIS. So, people who have made significant commitments to learning Cisco certifications can transfer at least some of their existing exam time. During the call I asked a number of questions that matter to people committing time to learning. Cheating – HP says it has allocated money and resources to tackling cheating and braindumps. The people on the call say that they are committed to solving the problem, however, I’m not sure that they are totally committed. Therefore, expect about the same level of results as Cisco has achieved on cheating – basically none. Textbooks and Study Resources The Certifications team are working on authors and books now, and expect to get resources out in the future. No dates or details so it’s probably a long way out. Remote Labs The specifically mentioned providing access to remote access labs and resources that allow people to get access to equipment. This is finished yet, but there are plans to offer this. 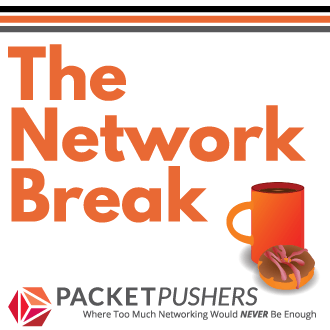 I think that this is a response to to the topics I raised in What Does HP Networking Need to Do Be Successful ? and providing access to emulators like what we have in Dynamips today. That’s nice, but I don’t believe that access to remote labs is an answer. It will cost HP too much to resource, run and maintain and probably won’t last long. And only an emulator can be configured to match your real network for change testing purposes. The development of certifications is the logical step around overcoming the objections of engineers. GIve most engineers a good certification path to backup their career aspirations, and you’ll provide a level of assurance to commit time to passing those exams. Engineers will implement what they know, and training programs sell equipment but it’s a long term investment that needs HP to invest over years. In todays world, only quarterly figures matter so I’m hoping they intend to make this long term. The challenge now is the make the perceived value of the exams worthwhile. I’ve seen any number of certification programs fail over the last ten years, and only Cisco has made it worthwhile and valuable. HP needs to deliver on the books and training resources, show commitment to preventing the worst of the cheating, and generate some buzz so that people won’t say no. 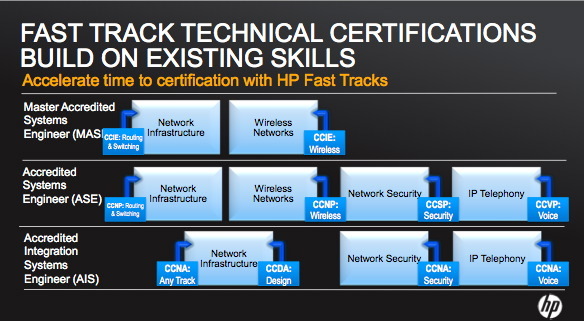 I’d say that getting to people to choose HP certifications is a challenge, but getting people to say “ok” would be a success in the short term. In summary, a solid next step. I’m still waiting on product information and some field stories before I’ll get excited. Anyone got experiences on the 3Com gear and got stories to share ? Get contact page and let me know. I’d be interested in hearing real experiences on whether the Huawei / 3Com equipment works well. Another thing I have my doubts about is the CCIE entry requirement. Will the additional course material do justice to the CCIE level? I’m currently holding a MASE in wireless and have to admin that the knowledge required to pass the tests is nowhere near what you have to have to pass the CCNP tests (1 one to go). The overall feeling I’ve got with the course materials is that it’s a collection of examples and manuals. Good article. I just sent my Cisco certs over to HP so I can get credit for a few of these. On another note, I recently designed and built a network with about 100 3Com switches. We used 7 of the 4800G in a stack as the collapsed core and about 90 of the 4500 series at the access layer. We did minimal L3 routing, mainly intervlan and multicast in Pim Sparse-mode. It worked well enough, stacking was a little bit of a challenge and there were some limitations we ran into regarding the number of multicast Pim-enabled vlan interfaces, but otherwise the price was about a 1/3 of a comparable Cisco solution and the equipment has been in production for a year now without failure. I’d use it again if a customer wanted it. Hey Greg, thanks for sharing all this info and infographics. What’s a “braindump”, by the way? Some kind of cheating method? I do like the fact that HP are recognising that no everyone needs to start from the billy basics… those of us who have been in the industry for years are probably going to find the fast track option quite attractive (and our employers too!) as long as we have some recognised certifications we can use for credits… I’ve heard that EMC and NetApp count towards it, but do you have a full list? 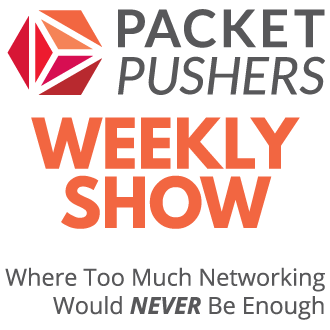 I agree about the need for proper HP networking study resources, especially if companies are free to train internally according to the books/syllabus.